Cryder House is one of six “houses”, or smaller communities, into which Fulton is divided. Cryder House was named after Bob Cryder because of his O’Fallon roots. Fulton assistant principal Alex Herrell said the 2018-19 school year was the first year implementing the “house” philosophy. It’s goal is to positively enhance the social and emotional culture of Fulton Jr. High. Eighth grade English teacher Laura Derstine helped get the program on its feet, according to Herrell. Coincidentally, Herrell said he had the pleasure of meeting Ron Clark at the recent ASCD Empower Conference in Chicago. He was the keynote speaker. On the first day of the school year, Herrell said students took part in a sorting ceremony that determined which of the six houses they would belong to for the remainder of their time as a Fulton Panther. Each house is named after a famous or influential person in O’Fallon’s history. Schwarz House represents George Schwarz and his O’Fallon dairy plant. Schmitt House represents Joseph Schmitt, a NASA spacesuit pioneer. Cartier House represents Lionel Cartier who initiated O’Fallon’s park system. Peck House represents John Peck, O’Fallon’s first postmaster. Ogle House represents Joseph Ogle who made O’Fallon’s first modern-day settlement. And of course — Cryder House, which represents Bob Cryder. Herrell said one of the first activities students did was create a house crest that represented both Edward A. Fulton, who was a former District 90 band director, and also their influential O’Fallon namesake. 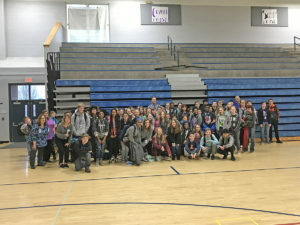 Throughout the year, Herrell said the students and house teachers have engaged in team building and relationship building activities to promote positive relationships between peers and between peers and staff. Each house is divided into smaller “dens” to allow for more intimate conversations and relationship-building. Additionally, the students have engaged in student-led kindness projects to foster positivity among others, both inside and outside of the school. Herrell said that Fulton staff is responsible for teaching students more than just academics. To find out more fun things happening at Fulton Jr. High, visit their Facebook page at https://www.facebook.com/Fulton-Junior-High-559025640962922/.